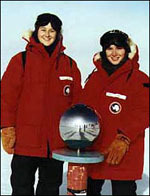 Jill Rathborne and Jessica Dempsey, when they were students, during an expedition to the AASTO observatory at the South Pole. This page aims to provide information on studying astronomy and how to find a career in astronomy to various age groups. Aims to advance the level of public awareness of the excitement of astronomy and of the international importance of Australian astronomy, while promoting the teaching of astronomy to students and the public. These information sheets cover a number of astronomical topics with an Australian flavour. Produced by the Education and Public Outreach Chapter of the Astronomical Society of Australia. This page specifies Astronomy or Astrophysics related courses that are offered by higher education establishments. Australian public observatories, visitors centres and planetaria listed by state. This page is designed to give prospective PhD students hints about applying for PhD scholarships. Astronomy has the power to instill a sense of wonder and joy in students and teachers like no other subject. Make learning fun while using the latest online resources and information. Presented here are links to interactive tutorials and worksheets, general educational links and public astronomy courses. Many universities and observatories offer summer vacation scholarships to science and engineering students in their third or honours year of studies. Scholarships are generally offered for between 6 and 10 weeks over the summer vacation period.